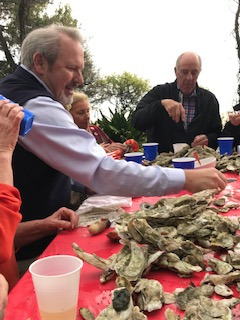 The Oyster Roast on Saturday night was a great success. 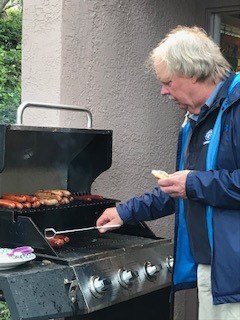 Thank you to John Farrenkopf for organizing it and working so hard to make it a success. 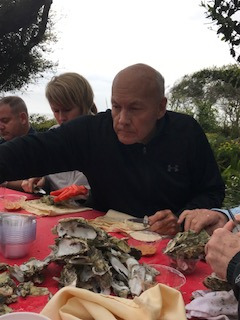 Thank you to Otto and Frances Farrene for hosting it at their gorgeous home on the beach. Heritage is next week. Need help this Saturday to set up. Be at the booth at 9:00. Need people with trucks. Ben will also need help at the storage unit. There are 200 inside storage and 20 outside. There are 45 wet slips. There is also a mechanic shop there. They are a Suzuki dealer and do hull cleaning as well. There are several charters that go out of Broad Creek Marina and they are individually owned businesses. The marina has 18 employees. It is one of two dry storage places on the island. Expansion of the facility is possible. Also on the property is Up The Creek Pub & Grill. This is the hardest thing to staff. Zipline Hilton Head is also part of the business. It is a 2 hour guided canopy tour with heights up to 75 feet. It is for ages ten and up and weight of 250 or less. It is an ecological tour. Aerial Adventure is a 2 hour self guided tour and is manipulated using hands and feet and is rated like a ski course. They are looking at Outdoor Electric Go Carts for the future, hopefully opening in May 2020. The vehicles are like golf carts but lower to the ground. They will not be visible from the road, are not very noisy and will be limited to reach speed of 15 to 17 mph. This is not a race, but timed against the clock. Check out the marina at broadcreekmarinahh. President Ben called the off-site meeting to order at the Coastal Discovery Museum. VLR provided monies to start the Discovery Lab on the Museum property and will have a tour of the facilities after the breakfast and meeting. Tim Ridge circulated sign up sheets for Founder's Night which will be held Saturday June 23 at Shipyard. Rex Garniewicz, President and CEO of the Coastal Discovery Museum was introduced by Jennifer Stupica who is an employee of the Museum. Rex gave a history of the museum which was founded in 1985 and was located at two separate locations prior to its move to Honey Horn in 2007. Honey Horn, a historical property was purchased by the town in 1990. Pictures from long ago show that there were not many trees, but much has grown up over the years. The property contained several historical buildings which have been restored. 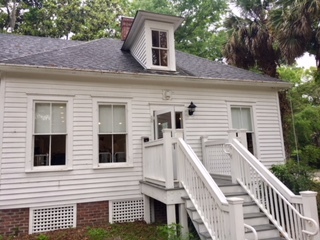 The new mission and vision of the museum is: The Coastal Discovery Museum inspires people to care for the Lowcountry. When Rex came to the museum, the "Supervisor's House" was in very bad shape. In January 2015 he provided a program to VLR which made the club aware of the needs and the desire to renovate the house, which led to VLR making a donation to help make the Discovery Lab a realization. 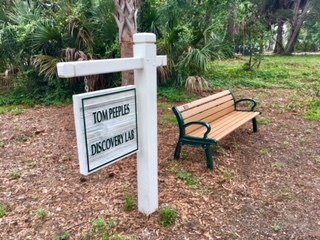 The Discovery Lab opened September 29, 2016 right before Hurricane Matthew hit. The Lab made it through the hurricane, but Rex's house was destroyed. Access to the lab was limited for quite a while because the Honey Horn property was used to grind up the island's fallen trees and was full of large equipment. Since that time, more and more programs have been added, with the lab providing a multitude of learning experiences. 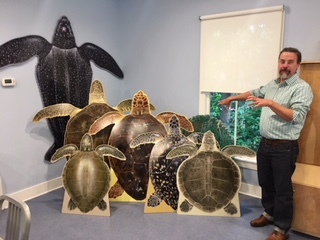 The museum, in spite of being a small museum, has been named a Smithsonian Affliliate because of the unique programs that are offered, based on our island location. Rex named many of the popular programs and some of the exciting up coming summer programs. There are currently forty programs per week!! 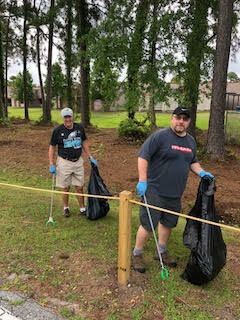 On a recent Saturday Morning some members of the VanLandingham Rotary club gathered at Hilton Head Island High School to get the grounds in order for graduation. Alright! 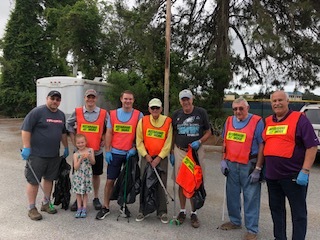 In case you were not in attendance last Tuesday, you missed a nice tribute to Jennifer DeHart (Leaving soon for a promotion to Fidelity's Jacksonville office. We don't want to keep you in a state of perpetual disappointment so here is a replay of the tribute. Thanks to Ronzo for editing this short video. Alrighty? 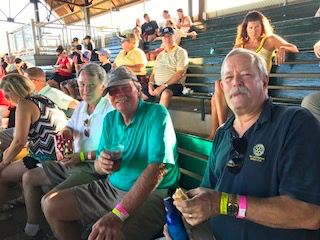 John Farrenkopf reported on the successful social event on July 12. 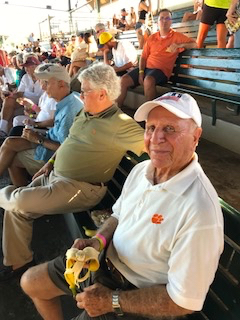 Members, family and friends boarded a bus at the high school and left at 4:15 to see a Savannah Bananas game. Thanks to Ray Makalous for arranging the trip and to John Farrenkopf for arranging the refreshments en-route. All had a great time. Check out all the photos in the photo gallery on the left. Photos are courtesy of Ray Makalous, Ivan Bennett and Barry Davis. Ben handed out sign up sheets for the following committees - chair is listed following: Social - John Farrenkopf; Membership - John Carroll; Program - Chuck Wiseman; PR - Lynn King; Vocational Service - needs one; Auction - Kristen Kelly/Matt Murphy; Popcorn - David Pierce; Heritage - Alicia Taylor/Matt Murphy; Service - Maxine Parsons-Kogut; International Service - needs one; Scholarship - Ivan Bennett; Youth Programs - Ivan Bennett There is still time to volunteer for various committees, so if you didn't get a chance to sign up today, let Ben know how you would like to be involved. Sgt. at Arms Chuck Wiseman introduced visiting Rotarians, collected Happy$, and told a "bad joke of the day". He also introduced a new feature "Rotary Karaoke" featuring the voices of Ben, Jennifer, John Farrenkopf and John Meyer. Ben spoke of the good works that the VLRC has done over the past year and the fact that it has donated over $140,000 to local charities. He named many of the recipients of our efforts. Barry Davis, web master was our speaker today. He relayed to the members that our website has a new design - a clean, modern look and the reviews have been favorable. He explained how to use the email function in ClubRunner - which makes it easy for you to email any of the members. He also showed how to look at and print the club directory which is always a handy tool. All members are encouraged to login and check their profile information and make any updates as needed. If you have forgotten your password, contact Barry. 8:10 Past President Brian Neumann, filling in for Club President Ben Shelton, called the meeting to order. Nasser Shaheen offered the prayer and led the pledge. 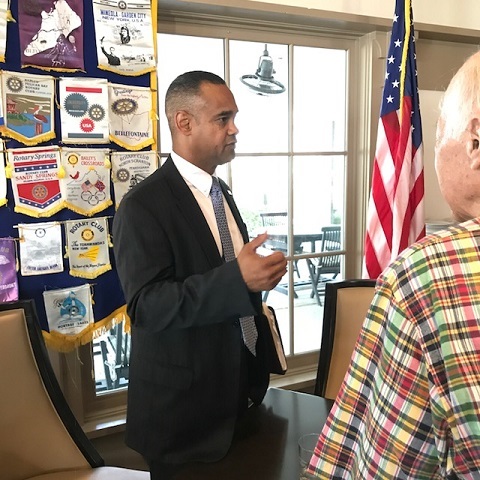 Ivan Bennett reported on the sign ups that have been gotten thus far for the Rotary Reader program. Remember that spouses are welcome to volunteer as well. If you have questions or wish to sign up see Ivan. John Carroll, who is the new membership committee chair, shared that there will be three areas of focus for the new year. They are: Recruitment; Less involved becoming more involved; and Engagement satisfaction. If you have suggestions, please contact John. 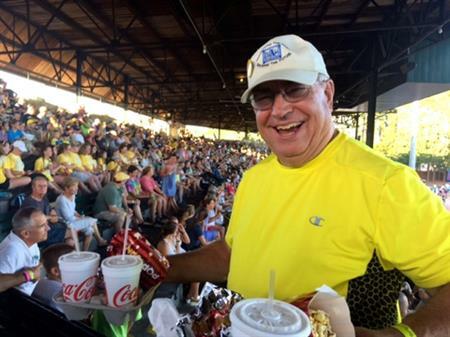 Tomorrow, Wednesday July 12, is the Savannah Bananas event. It is a double header but probably will only be staying for the first game. The bus will leave at 4:15 from the baseball field at the high school. There is still time to sign up. There are 33 going, but there is room for more. Cost is $15 per person which includes tickets, snacks and transportation. Next week, Tuesday July 18 the meeting will be a Club Assembly. There is also a board meeting at night at the Hickory Tavern. Tim Ridge reported that Roger Burns fell last Friday and broke his femur. He is now at MUSC where a successful surgery was performed. Roger is up and about and in good spirits. He will be at MUSC for a few days yet before returning home. Keep him in your thoughts and prayers. New Sgt. at Arms Chuck Wiseman started off the year by introducing visiting Rotarians, announcing important milestones, collecting Happy $, and telling a "bad joke of the day". Special Agent George E Graves, Jr. from the FBI Columbia Field Office was our speaker. He is a twenty one year veteran with the FBI and is assigned to the Columbia Field Office, Hilton Head Resident Agency. He is a native of New Jersey and has conducted complex white collar crime investigations, which included public corruption, bank fraud, mortgage fraud, securities fraud, health care fraud and civil rights. Special Agent Graves has investigative responsibility and Beaufort, Jasper, and Hampton Counties. An expert on fraud, Special Agent Graves began by putting $5 in Happy$ because he said these days he is happy "just to be invited anywhere". He has spent most of his career working on fraud and spoke of how technology has contributed to the crime of fraud. He gave several examples of scams, particularly related to our area, as well as some "red flags" that you should watch out for. One scam is the IRS scam - a phone call is made telling you that your taxes have not been paid and unless you pay them you will be arrested. First red flag is, the IRS would not make this accusation over the phone. They would come to your door and make the charge. Second red flag is they will tell you to make payment by using a "green dot" card. This is a card that you put money on and they will be able to get the money when you give them the number. Not traceable to them. Another red flag is if they ask for you to wire the money via Western Union - money gram. If you get a phone call from the IRS - don't panic - that is not how they do business. Another local scam which took place 2015-16 was the "jury Duty Scan". Again a phone call telling you that you missed jury duty and need to pay the fine. This particular scam was being pulled off by inmates at a correctional facility in Georgia. Several correctional officers smuggled smart phones into the inmates who then extracted real names of law enforcement and judges in the lowcountry and used this information to attempt to get payments wired to them. Many were arrested in this case and it involved hundreds of thousands of dollars. Another scam locally was an online dating scam, dubbed the "lonely heart romance scam". The perpetrator created a profile on a dating site, and for months developed a relationship with a wealthy lady. After gaining her trust, he told her about a business venture that he had needing money. He asked her to wire money to a third party (again a red flag). Several payments were made to him totally almost a half a million. After his guilt was revealed to the lady she found it difficult to believe. Realtors and lawyers are another target for scammers. A phony email page will be sent to the business, with an appealing service or something related to business. When the link to the "information" is followed, malware is introduced and the frauder captures the email and begins monitoring email traffic. Eventually will take over the account at an opportune time to change links to forward payments to. Hundreds of thousand of dollars have been scammed in this way. Always DOUBLE CHECK who the emails are coming from (every single character in the email) before following payment information. Lots of great information - be aware!